We at ATI are committed to supplying our clients with the most innovative, up to date, and energy-efficient gas boost system products available, and the Greenbooster system manufactured by Action Blower & Equipment (ABE) easily ranks high in that very exclusive category. While ABE manufactures a multitude of high-quality products, many of their customers would agree that the Greenbooster is the single most important product they market. And for this very reason, Greenbooster is available with all of ABE's gas boosting packages. 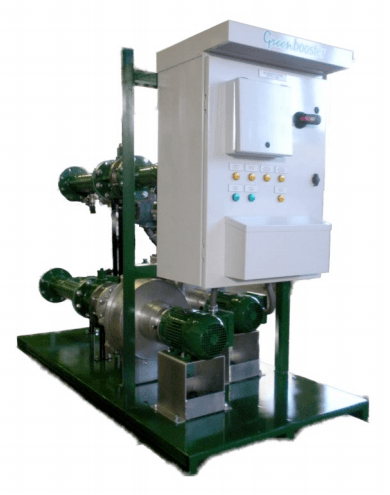 Greenbooster is a turnkey gas booster system that uses a GT 1400 hermetic gas booster and comes complete with all necessary piping, valves, control mechanisms, gauges, and other accessories. Greenbooster's most important feature is its ability to sense pressure levels and then respond by adjusting motor speed to that which is necessary to boost gas pressure to the desired level, but not to exceed it. This saves valuable energy and qualifies Greenbooster for LEEDS points as well as for numerous other incentives/rebates. Static hermetic seals only (no dynamic seals) to prevent wear/leakage. Motor and blower that are magnetically coupled together, with a gas-tight barrier between them. Motor that never comes in contact with gas, removing the need for explosion-proof engineering. No lubrication needed, making maintenance needs almost non-existent. Easy-access motor that makes inspections fast and simple. Greenbooster Package A is ideal for applications where boost demand is highly variable or the pressure of the gas supply frequently changes. By means of a PID control, a constant discharge pressure is maintained. A pressure transmitter strategically and safely installed at the discharge point provides pressure-level feedback to the control panel. Package B is a more cost-effective solution to boosting gas pressure, relative to Package A, when gas supply and system pressure is already fairly stable. Package B is pre-programmed to run at a constant speed, which can be adjusted as needed using the VFD. This package utilizes remote-start technology. Package C is the least costly of all Greenbooster packages to run and is also used on applications where constant pressures are already the norm. The system is capable of both manual and remote start-up.